The Sparkling Hoard: $577 for the Piggies! Hey folks! Just in case you missed me mentioning this on Facebook, the auction raised $577 for the pigs! 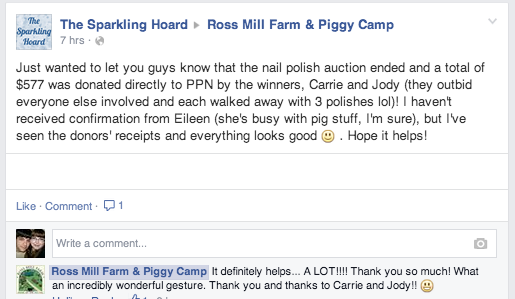 Many thanks to Jody and Carrie, who each took home 3 polishes, and to everyone else who bid and tried to win! And again, thank you to the indie brands who helped make it all possible <3 (Indigo Bananas, Elevation Polish, Dollish Polish, Darling Diva Polish, ALIQUID Lacquer, and Smitten Polish). I'll be back to blogging again soon! The auction took way more time and energy than I had anticipated and I got a bit delirious towards the end there haha. It was worth it, though!